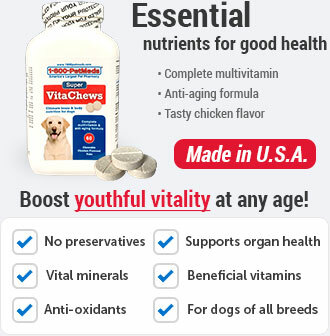 Cholodin is a chewable dietary supplement that helps remedy various conditions in senior dogs. 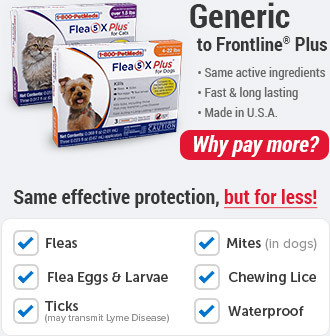 It has been recommended by veterinarians for age-related problems, including fatigue, poor coat, constipation, inappropriate urination, poor appetite, and poor mental performance. 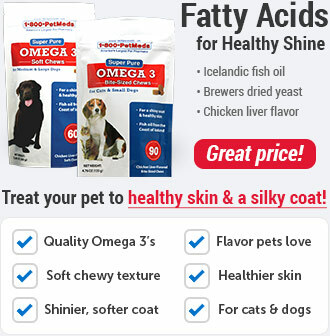 Cholodin contains choline (a nutrient in the vitamin B family), amino acids, vitamins, and minerals to help restore a youthful vigor in your pet. 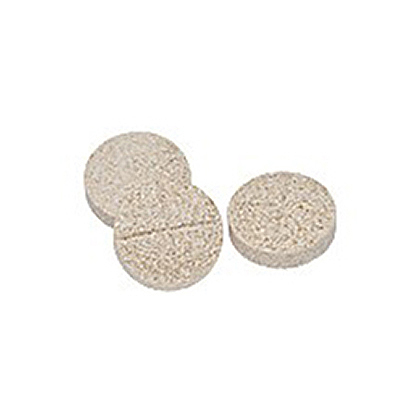 The tablets should be given on a daily basis, and can be fed by hand or crumbled and mixed with food. If your dog shows increased neurological activity (hyperactivity, social agitation, muscular twitching), contact your veterinarian. Infrequently, pets on a choline loading regimen will show signs of increased neurological activity such as hyperactivity, social agitation, muscular twitching, etc. If these responses are noticed, cessation of tablet administration will quickly result in disappearance of these irregularities. 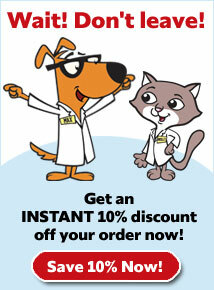 After a period of 3 or 4 days, your pet may resume the same dosage, usually with no adverse reaction. Keep out of reach of children and pets. Cholodin is a chewable dietary supplement containing Choline (a nutrient in the B Vitamin family), amino acids, vitamins, and minerals. 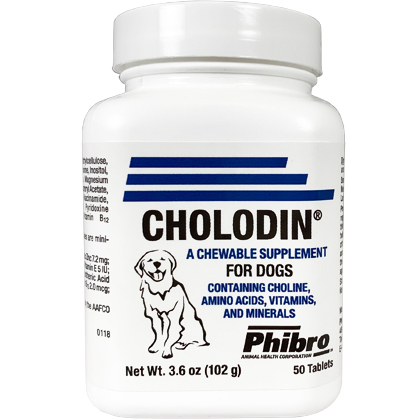 Cholodin is formulated for use in geriatric pets. Cholodin is for dogs only. Do not give to cats. 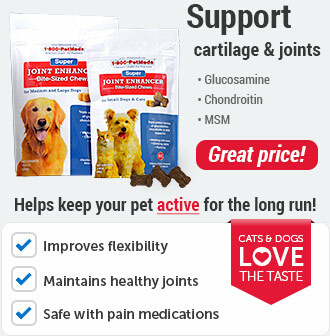 The chewable tablets can be fed directly to the pet by hand or crumbled and mixed with food. In rare instances a pet may become hyperactive. 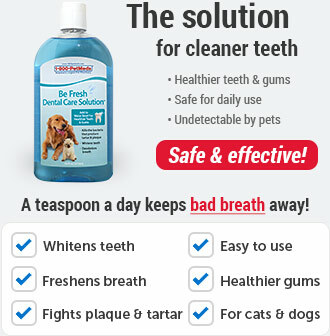 Discontinue giving the product for 3 or 4 days and then resume the same dosage. Other Ingredients: Lactose, Lecithin, Powdered Cellulose, Silicon Dioxide, Choline Chloride, DL-Methionine, Inositol, Animal Liver Meal (Pork), Dried Beans, Magnesium Stearate, Torula Dried Yeast, DL-Alpha Tocopheryl Acetate, Zinc Oxide, Thiamine Mononitrate, Niacinamide, Riboflavin, Calcium Pantothenate, Pyridoxine HCL, Sodium Selenite, Vitamin B12 supplement.